Fans of Elijah of Buxton, Trouble Don't Last, and Stealing Freedom will be drawn to this tale of the incredible journey of an abused twelve-year-old white girl and an escaped slave girl who run away together and form a bond of friendship while seeking freedom. Every day is a misery for a nameless, motherless Southern girl who is treated cruelly by her pa and brothers. Her life changes forever when a runaway slave named Zenobia turns to her for help and shelter. Longing for her own freedom, the girl decides to run away, and she and Zenobia set off on a harrowing journey. Along the way, Zenobia names the girl Lark, after the bird, for her ability to mimic its song. Running by night, hiding by day, the girls are pursued by Lark's pa and brothers and by ruthless slave catchers. Brightwell, another runaway slave, joins them, and the three follow secret signs to a stop on the Underground Railroad. When the hideout is raided and Zenobia and Brightwell are captured, Lark sets out alone to rescue her friends. 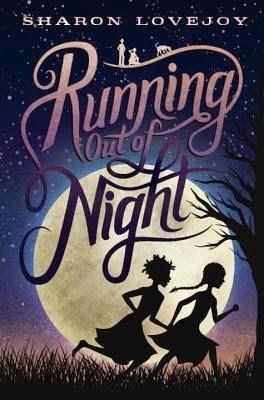 I enjoyed reading Running out of Night. Lovejoy did a remarkable job researching this era in history and it is a fantastic first novel. I was impressed with the use of dialect during the set time period of 1858. The dialect was used in a way that was true to the south but not so broken that a student would not be able to understand it. There was little to no confusion as to what they meant in the southern slang; I had little to no trouble reading it through and did not stumble on any words. Due to the age of my students I am always looking for a good example of dialect and this story hit the mark. I felt the book had a Twain'ish feel to it; something that you will better understand when you read it. The plot moved at a steady pace and held my interest. There is a proverb at the beginning of every chapter that warms you up for some event that was sure to happen in the next few pages. I found myself guessing and anxious to see how it would fit in. If a candle burns blue, it is a token of bad luck, for it indicates the presence of a death sperrit. Moment in the chapter: The Candle on the table guttered, wavered, and burned blue—the bad death light of sperrits. By the end I really felt for the main character and still wanted to know if she would ever be reunited with Zenobia. And I can't help but hope that there will be a sequel or at the very least a novella. Bravo Lovejoy, it was excellent and Twain worthy. I would recommend this book to my 6th grade students. ChOi tien len mien bac và game Tien len mien nam de cho thanh trieu phu vơi game binh xap xam.